It's so annoying when business gets in the way of running, but that happened this week. I missed my Friday morning run because I had to go into the office for a meeting. I did run on Monday because I was home for the Labor day holiday. I don't know if that counts as part of last weekend's activities or it it's part of this week's. I'll have to look in the rulebook to get that answer. One other thing I did on Labor day was order a pair of New Balance Zante v2s through the Shoekicker site. It was just about a year ago that I got my Kinvara 5s the same way. In both cases I got significant discounts. I have no affiliation with Shoekicker, but I recommend it if you are confident enough to buy a shoe without first trying it on. I picked the cheapest shipping option and didn't expect to get them for at least two weeks. Last night, in the middle of dinner, Mrs. Emerging Runner said, "Oh, I forgot to tell you, your shoes came today." Here's the thing about me and running shoes. I like them a lot. Especially new ones. I couldn't believe I'd just wasted the past hour having dinner when I could have been trying on my new Zantes. I hurried through the rest of my meal and then scoured the den in search of a box from Jackrabbit Sports. I purchased the Zantes because my beloved Kinvaras were getting deeply worn on the medial side of the heel.This is the curse of the pronator and, due to the type of shoes I favor (blown rubber out-soles) I tend to wear them out after 500-600 miles. It was the exact reason why I'd replaced my Virratas with the Kinvara 5s last year. Years ago, I ran in less minimal shoes like the Brooks Adrenalins that had EVA and carbon rubber in high wear areas. They were heavier, but I could get over 900 miles out of them. I've had shoes sent to me by manufacturers to review or mention in the blog. Due to a possible conflict of interest with my day job, I no longer do that. I wasn't paying for those shoes, so I didn't particularly care if they fit me well. When I'm paying, I'm very concerned. There's a moment of truth when I first try them on because there's something at stake and a decision to be made whether to keep them. Once the Zantes were unboxed, I began to gather impressions. Lightweight, but not as light as the Kinvaras. Nice, breathable one piece upper. Slightly higher drop than the Kinvara, but similar stack height. 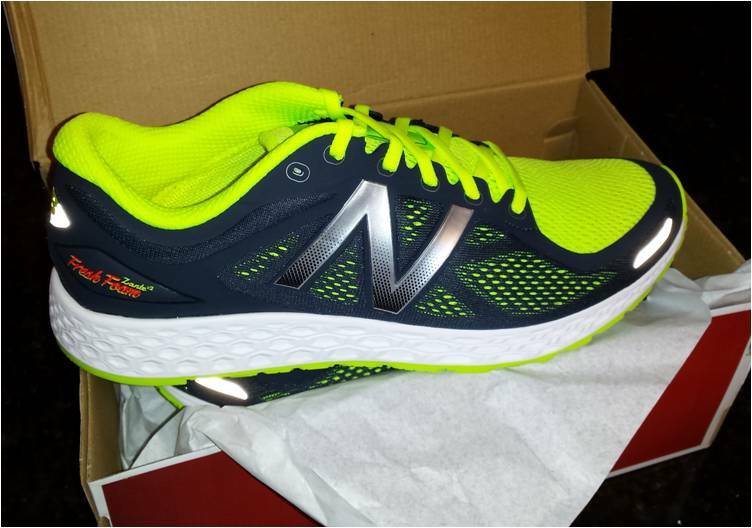 I've always liked New Balance shoes, but did not like their Minimus models that I felt ran too narrow and had a pronounced bump toward the forefoot. The Zante v2 is very new school, similar to Saucony and Asic's newer, less structured models. I tried on the Zantes and my first impressions were mixed. The toe box is roomy. That's something I like due to the shape of my foot. However, I was concerned that I ordered them in too large a size. I have to be careful about sizing. I normally wear size 11s and run mostly in Saucony models. The size 11 Zante felt a half a size larger than the Saucony size 11. Due to that, I was concerned the Zantes might run a little sloppy. When I cinched the laces, the upper wrapped securely and held my foot well. A few quick steps around the house and on the treadmill confirmed that they were keepers. I went out early this morning because I needed to finish my run in time to make an appointment. I also wanted to beat the heat, but there was little chance of that. At least the sun was low and mostly hidden by cloud cover. It was humid but still runnable. I paid close attention to the feel of the Zantes as I took my first steps from my house. They felt stable with no issues with the fit. Toe-off was smooth and responsive. The forefoot was supportive but not overly firm. I felt a little more cushioning than I get from the Kinvara. To be fair, the Kinvara has 500 miles on it and the Zante is brand new. I moved along well and my run felt faster than the numbers indicated. The Zante's mid-sole promotes a rolling gait and the overall firmness gave it a fast feel. I wasn't tracking my mileage but in the almost five miles I ran with them, I could tell that this would be a good distance shoe. I picked up the pace on my last mile and got some decent speed despite the increasingly oppressive humidity. I'm looking forward to my next run in the Zantes. I decided to get them after reading a review in Runblogger that suggested the Zante as a strong competitor to the Kinvara 7. I wanted a change and I was curious to see what New Balance had to offer. So far, it's an offer I can't refuse.